Internet of Things you can make – Make a WiFi Weather Station With Arduino and Adafruit’s CC3000 breakout « Adafruit Industries – Makers, hackers, artists, designers and engineers! 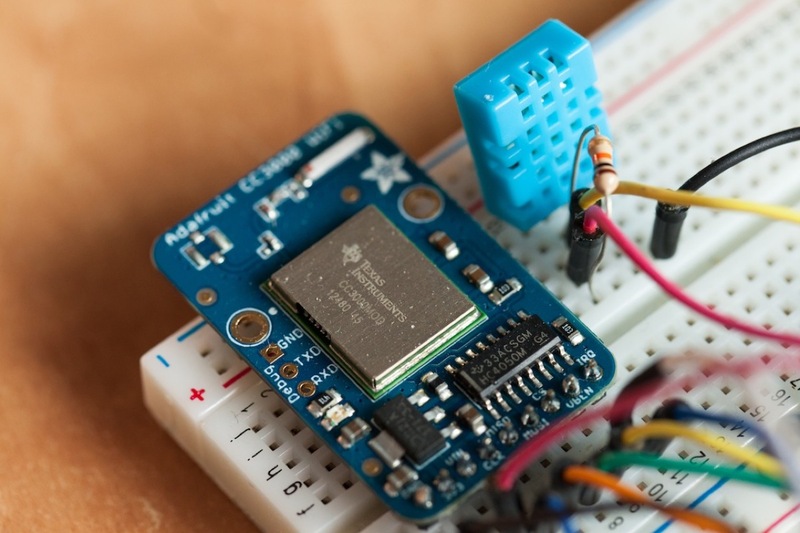 Make a WiFi Weather Station With Arduino and Adafruit’s CC3000 breakout. As open-source hardware users and makers, we love playing with new chips, boards and tools. And there is one chip which is quite popular these days: the CC3000 WiFi chip from TI. This chip comes with many promises: cheap (around $10), easy to use, low-power … It was featured in many articles around the web, but somehow it was quite hard to use with Arduino as there was no breakout board or library available. Luckily, Adafruit solved that for us with a nice breakout board and a working library for Arduino. In this article, I will show you how to use this chip for home automation purposes. Remember that weather station project? We are going to do the same: measure the temperature and the humidity. But this time we won’t display the information on an LCD screen. Instead, we will transmit the data wirelessly via WiFi to your computer and display it there. Excited ? Let’s get started! Adafruit CC3000 Breakout with Onboard Ceramic Antenna. 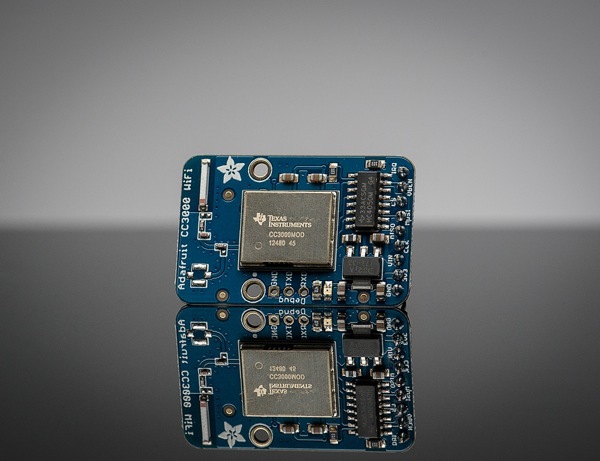 For years we’ve seen all sorts of microcontroller-friendly WiFi modules but none of them were really Adafruit-worthy. Either they were too slow, or too difficult to use, or required signing an NDA, or had limited functionality, or too expensive, or too large. 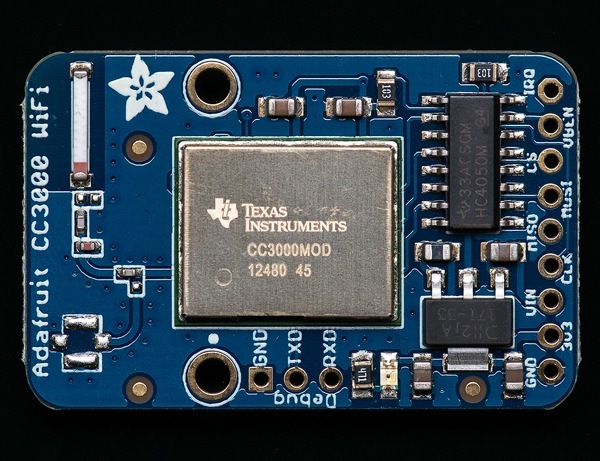 So we shied away from carrying any general purpose microcontroller-friendly WiFi boards. The CC3000 hits that sweet spot of usability, price and capability. It uses SPI for communication (not UART!) so you can push data as fast as you want or as slow as you want. It has a proper interrupt system with IRQ pin so you can have asynchronous connections. It supports 802.11b/g, open/WEP/WPA/WPA2 security, TKIP & AES. TCP and UDP in both client and server mode, up to 4 concurrent sockets. It does not support “AP” mode, it can connect to an access point but it cannot be an access point. We wrapped this little silver modules in a tidy breakout board. It has an onboard 3.3V regulator that can handle the 350mA peak current, and a level shifter to allow 3 or 5V logic level. The antenna layout is identical to TI’s suggested layout and we’re using the same components, trace arrangement, and antenna so the board maintains its FCC emitter compliance (you’ll still need to perform FCC validation for a finished product, but the WiFi part is taken care of). Even though it’s got an onboard antenna we were pretty surprised at the range, as good as a smartphone’s. Each order comes with one fully assembled and tested breakout and a small stick of header you can use to solder in and plug into a breadboard. We don’t have a detailed tutorial yet but to get you started, we’ve got a fully working Arduino library that is based off of TI’s codebase but adapted for use with the AVR. We also have example code showing how to scan the SSID’s, connect to your access point and run DHCP, do a DNS lookup to IP address, ping a site and connect to a remote TCP socket such as a website and print out the page. Please note the hardware is good, but the library code does not yet support all of the CC3000’s functionality. SSID scanning, connection, DHCP, DNS lookup, ping, and TCP client connections (eg connect to a website and grab data) all work and are tested with example code. UDP and TCP server connections are not supported yet! As we try to complete the functionality, check or subscribe to the github repo for instant updates. For now we suggest this module and codebase for people with some programming and microcontroller experience.